Outside the grocery world, few people may have heard of Jyve. The gig labor platform targets specialized grocery tasks like stocking shelves, merchandising, putting up displays, auditing and handing out samples as a brand ambassador for both brands and grocery stores. CEO Brad Oberwager said the company is ready to come out of “stealth mode” and shake things up a little bit in the gig economy world. The company just announced that it now has more than $400 million in bookings for work, has raised $35 million to date and has hired some big names to push it to the next level. 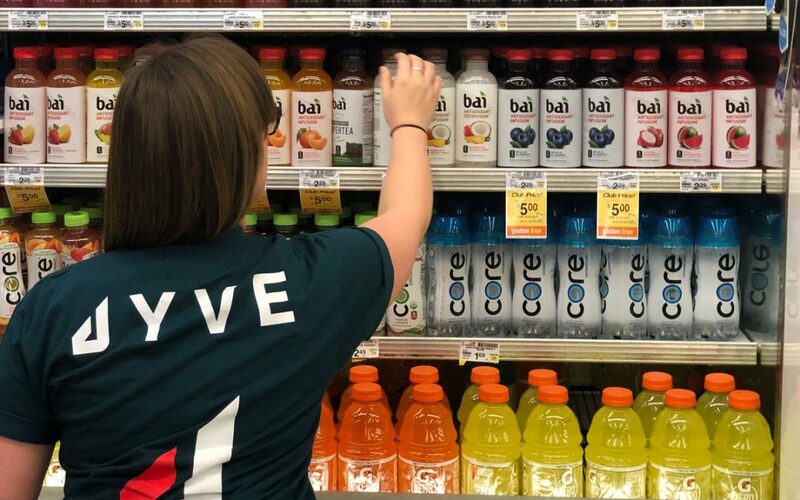 Yet another startup promising to shake things up isn’t big news these days, but Jyve has taken aim at Instacart and will now offer fulfillment solutions for grocery delivery in what Oberwager says is a more retail-friendly solution. “Instacart is an amazing company and has done some amazing things, but is not particularly good for the retailers they are servicing,” said Oberwager. He said essentially, the grocery chains that partnered up with Instacart could be supporting a direct competitor. The fulfillment at Jyve piggybacks on the specialized gig labor that Jyve dubs the “skill economy” that is already contracted for the store. So when a “Jyver” is stocking brands like Red Bull or Bare Snacks (which Oberwager also founded) for the brand and gets a delivery order, they can go bag the groceries for the grocery store, and get back to stocking. In essence, it blends the multiple duties from the brand like Red Bull, making the rows look nice for the grocer and fulfilling the delivery order for the grocery store. So instead of splitting the three tasks into three jobs, Jyve aims to funnel it through one person for efficiency. That cuts around a big issue with Instacart: delivery. Jyve just fulfills the delivery order and the long time spent driving an order to a customer is, according to Oberwager, more efficient when done by a pure-play delivery provider like Doordash or Postmates. And to get cozier with grocery partners, Jyve delivers all the data from orders through the grocery chain’s front end. Acting as a white-label backend for all the digital ordering features that people have come to expect without the margin hit or the loss of data. Oberwager said he sees a big gap for Jyve at the top of the list for largest grocery chains. He said beyond the top 100, mom and pops, small chains and boutique chains can do really well with traditional Instacart. But the large chains have the means to invest in a more robust partnership and stand to reap the rewards. The company has also hired Anu Gupta, a former Target SVP, and former Morgan Stanley banker Ralph Leung, who will serve as COO and CFO as the company moves toward an eventual IPO. The move, however, is an important signal that retailers are getting fed up with Silicon Valley. While every industry affected by the gig economy has seen the power of digital ordering, flexible labor and all the rest, they’re also sick of the costs and complexities. Whether it’s something like Jyve piggybacking on existing partnerships with new features or a third-party delivery program fulfilling in the background, watch for a second wave of disruptive companies buddying up with big enterprise clients to provide those valuable touch points, but in a margin-friendly way.